Paddington 2 is just as adorable as the first live-action Paddington movie. It’s just a new adventure in which Paddington Bear (voice of Ben Whishaw) makes new friends. 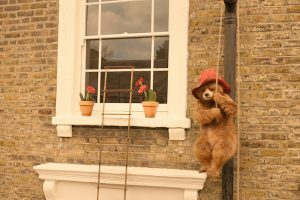 Paddington needs to get his Aunt Lucy (Imelda Staunton) a present for her 100th birthday. He’s got his eyes on a valuable popup book of London in Mr. Gruber (Jim Broadbent)‘s shop valued at some 1000 pounds. Before he can earn enough money to buy it, Paddington is framed by a thief who makes off with the book. 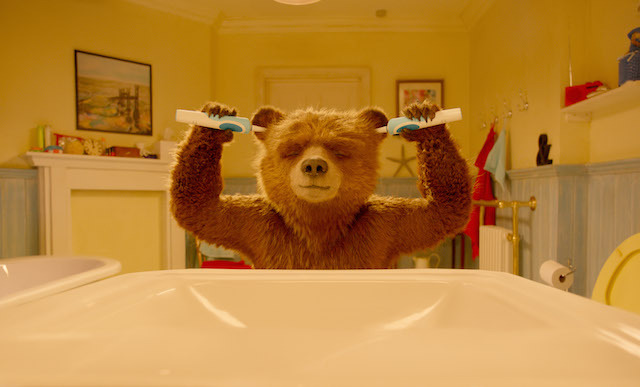 There are plenty of beautifully designed animated sequences where Paddington gets into some harmless trouble. Getting tangled in the chord of vibrating hair clippers or soaring up and down as a window washer could be Charlie Chaplin scenes. A sequence of the popup book come to life looks like a diorama with 3D bears running through it as tourists. It builds to a climax like a Steven Spielberg action sequence that keeps going and going, utilizing every character’s talent. After the first movie, Paddington now has friends all around London which is endearing to see. 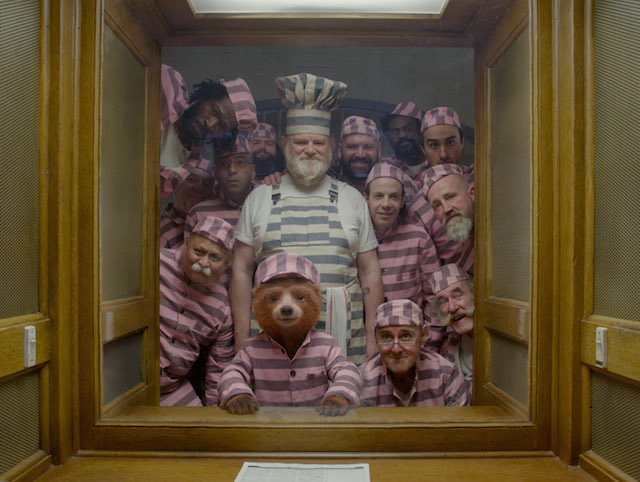 Even when he’s sent to prison for the robbery, Paddington remains positive in the joint. I t’s the kid friendly version of prison with striped uniforms and harmless goofballs. 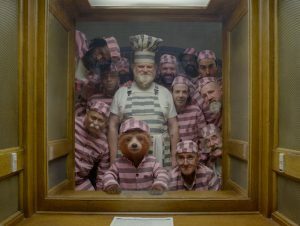 The meanest convict Nuckles (Brendan Gleeson) – with a capital N except with a K in the credits – is just surly until Paddington works his charms. 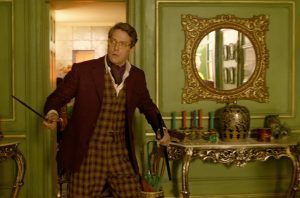 Filling in for Nicole Kidman in the villain role is Hugh Grant as has been actor Phoenix Buchanan. Where Kidman let loose after a career of reserved dramatic performances, the rom-com king embraces his total ham and it’s magnificent. I do question Paddington taking the fall. Yes, the robber disappeared, but it’s not like they found any stolen merchandise on Paddington. 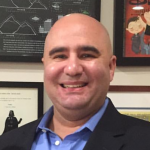 I’d think you’d need evidence to convict and it’s not like Gruber was pressing charges, but if a lawyer wants to dispute me, which one of us is overanalyzing a kids movie here? The plot is a tad more elaborate than the simplicity of the first film, but it does provide the framework for several caper scenes in and out of prison. 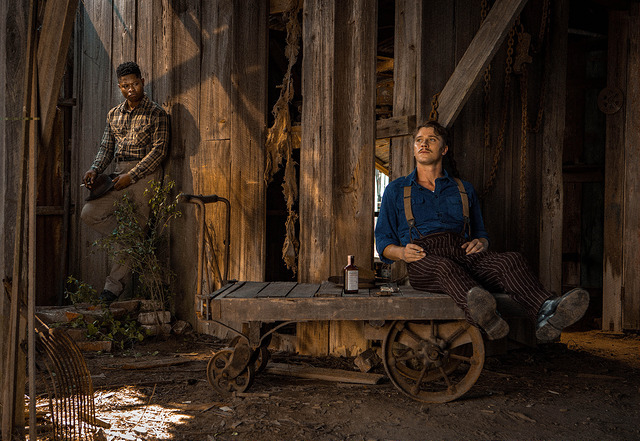 The entire Brown family has something to do in the story, and the kids have evolved naturally since the first film but not too drastically. Both Paddington movies give me the same feeling old Curious George shorts used to. 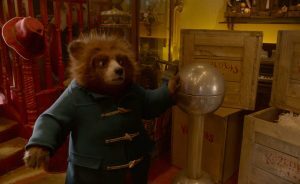 Both George and Paddington just want to do nice things for people, but it always goes wrong. I realize there’d be no story if it worked out immediately, but I always felt sad for George that his thoughtfulness backfired. 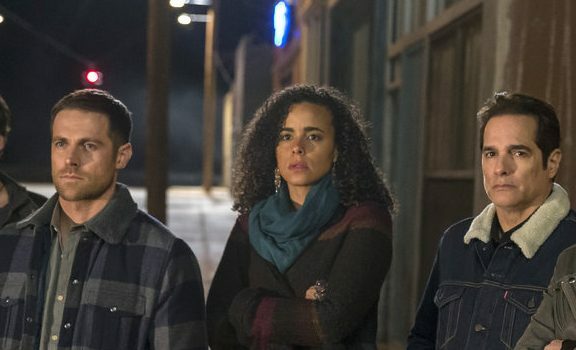 Sure, it ended happily but I was already sad that he had to go through the heartache. Now I realize that these are important lessons for children. At its most drastic, the road to hell is paved with good intentions. On a more basic level, yes, you have to think a few steps ahead of yourself to avoid danger. That’s got to be what parents feel watching their children discover the world for the first time. You’d love to save them from hurt feelings, but they need those experiences to learn life skills. And yes, you can turn things around with a good attitude. So, I guess the Paddington movies mean I’m ready to have kids now.